Son of the Age is a coming-of-age fantasy tale about a young boy who journeys across the land of Aun to find his mother. Along the way, he encounters danger, adventure, and life-changing friendships. Are you ready for a tale of danger, friendship and adventure? Join Lee Bezotte and I as we jump into the adventures across the land of Aun, while discussing the coming of age tale ‘Son Of The Age’. Lee, how did the adventure of this novel first unravel? This book began because I was looking for a way to tell the story of modern, fractured boyhood in a fantasy world setting. When you were seeking out to tell a tale about modern boyhood, did you reflect on your own life for important experiences to share? Yes. Some of the relationships in the book were inspired by my real-life relationships. Tell us a little more about some of these relationships between these characters. For instance, can you share a little more about these backgrounds of one of your most important characters? One of the main characters, Dulnear, is a combination of mentors and father figures in my life. And once you’ve rolled your mentors into the character of Dulnear in the landscape of Aun, what did you find was one of the central messages that you really wanted to share with readers? The story is fun and engaging but there is a deeper, more profound meaning to it that touches readers in a meaningful way. Creating words and stories that share a profound meaning to readers really is a fantastic skill to acquire. What did you learn along the way, when you were working towards developing and communicating meaning? Fictional stories can be powerful tools for teaching important life lessons. Indeed they are! As you’ve continued to craft your story making tools, did you find that your voice as an author had changed? And if so, how did it change? I’ve become more succinct in my writing, cutting past unnecessary flowery language and descriptions. Congratulations! Cutting out flowery and floaty language is quite a battle, and I’m glad to see that you’ve made great strides to snappier prose. Now that you’re writing shorter and sharper words, do you find yourself energised by the prospect of writing, or does the process of making it to the point get exhausting? *Laughs* Ah, the great challenge of combining energy and writing! It’s always tricky! When you’ve gotten yourself in a writing groove and the energy is easily flowing, what flashes up in your mind? I walk through the country a lot and it inspires my writing. I make sure to save those inspirations in a notebook and draw on them when I’m writing. Oh, that’s an awesome idea! I love the mental picture of you toiling away on a sentence, and then opening your sketchbook to refresh your memory. It just seems so writerly! And as someone who is perfecting a writerly profile, I’m sure you’ve got a few new projects in the works. What can you tell us about them? I just wrapped up the sequel to Son of the Age and will begin working on book three shortly. Very exciting! Good luck getting the sequel wrapped up and getting it out to readers! With a new book coming well on the way, and another one on its heels, have you started to think about marketing yourself as an author brand to ensure that your readers can find you in the crowd of books? Social media has been huge in building an author brand. I really enjoy engaging with readers on Twitter, Facebook, and Instagram. You know, being able to directly chat with your readers has to be one of my favourite things about creating and maintaining an author brand. How lucky are we that so many writers not only have the ability to master their craft but can directly connect with the readers who love their work on a daily basis! Lee, thanks so much for sharing a little taste of your author brand and the thoughts behind ‘Son of the Age’, and I hope to see the next instalment in your brand soon! Excited to read the book we discussed today? Find it here on Amazon: ‘Son of the Age ( ASIN: B01IYMRTZ4 )‘. 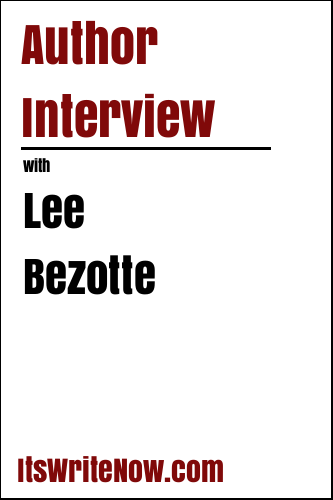 Want to find out more about Lee Bezotte? Connect here!